I don’t currently have any tattoos. This surprises none of you, for though I may be a flaming pinko commie on the political spectrum, when it comes to how I live my life, I’m quiet, conservative, and reserved. But when I started this path in ADF there was an image that caught my eye, and I fell in love with it. With what it means, and with what it looks like – it’s just an aesthetically pleasing image to me. Ian Corrigan created it – affectionately known as the Cosmos Sigil – and it is unofficially the symbol used by ADF priests and groves. It’s the primary symbol on the stole of an ADF priest, and many of us have it carved or painted on world pillars or pieces of art that we use on our altars. And I looked at it and thought “I want that as a tattoo”. But I was new to ADF, and I figured impulsive tattoo getting was both a) dumb and b) really out of character, so I filed it away and nursed the idea and let it grow. A few years ago, when I got serious about my path as a priest, I started to really consider this a thing that I would be doing. I made it about a goal. I would get this tattoo when I was ordained, as a gift to myself, and as a symbol of my ordination. I meditated on it. 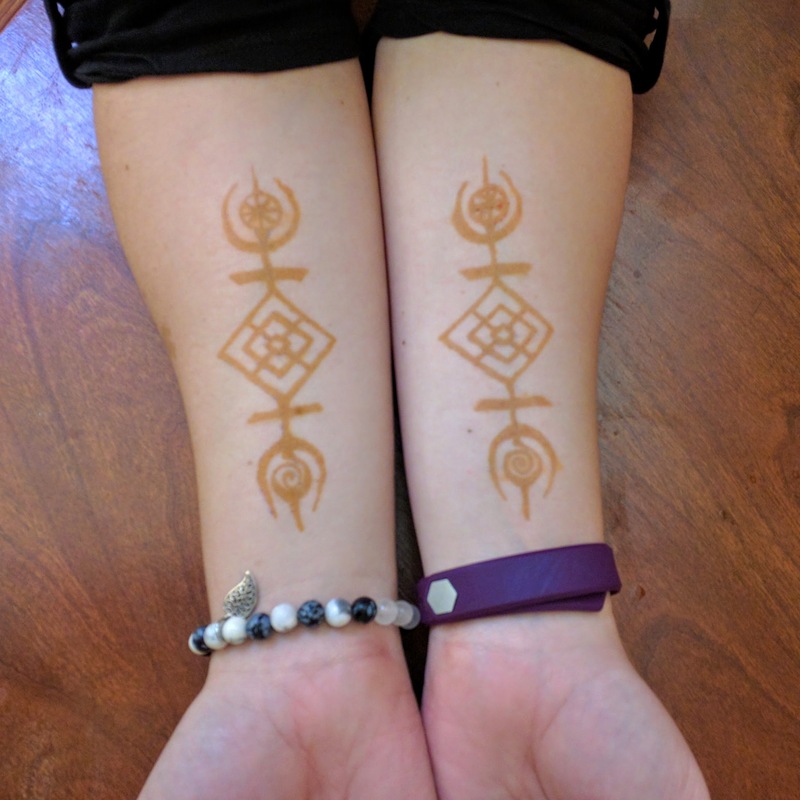 I had a friend who is good with henna dry-run the tattoos for me twice, to make sure I liked them, liked where they were placed. And I did. Having them on me was just right – it was how things were supposed to be. So I settled down to wait until I finished the first circle of Clergy Training, so that I could formalize the arrangement. Well, that time is upon us, but my tattoo artist (that I picked out after seeing wonderful work that he’d done for friends) was booked through until May, so I was going to get the tattoos as a reward for having been ordained. I messaged him about something, and he got all excited – he’d had a cancellation this Saturday, and did I want to come in and get them done now, so they’d be all healed and glorious for my ordination ceremony. After a quick check in with the friends I want to go with me, I agreed. So on Saturday I go to formalize an arrangement I’ve made with the Gods and Spirits, in a way that is permanent. I’m a little nervous, but mostly excited. One more step on the process that is taking me from where I was to where I’m going. *Yes, I’m covering my hair full time right now. This is not a religious mandate (yet) but something I have felt called to do, and that makes me feel beautiful. So I do it! So far nobody has commented negatively on it, probably because I’m wrapping Tichel style and not Hijab style. I’ve been reading Kathleen Norris’ (wonderful) book The Cloister Walk, about monastic spirituality, as a sort of side piece to all of the work I’ve been doing and to kind of keep me sane as I prepare for ordination and all the rest of the hoopla that is my religious life right now. And one of the things she talks about is the idea that, at least for Benedictine spirituality, formation is endless – the conversion of the self is a process that takes a lifetime. So I sat down and looked at a typical formation process for someone in the Catholic faith vs what I’ve done, and realized there are some similarities. With apologies for generalizing, as each community really does have its own rules, and because what I’ve done is nowhere NEAR as dedicated as true monastic life, it still struck me that there were things that I could relate to. My dedicant year was the equivalent of basic religious education – it gave me the tools to get started on the path, and set me up with a spirituality that I could practice satisfactorily for the rest of my life. This only took me a year, but for others it is the work of a lifetime, and that’s more than okay. The 2 years I spent working CTP-Prelim were my postulancy – where I figured out whether this whole priesting thing was really going to be for me. It was a longer process, but like all processes – like all formation – it takes however long it takes. I did a lot of work, internally and externally, between August 2014 and August 2016, and I don’t want to shy away from that. It involved a lot of confirmation that what I was doing was really the right thing, and set me up with a lot of the spirit relationships that have continued to nourish me through to today. From August 2016 to March 2018, I was a novice – not yet having taken any formal vows, but having applied and been accepted to my community of faith and living as best I could the life and spirituality of a priest in my community. I did the clergy student discipline, I spoke with mentors who assisted with my formation and my growth. I studied hard, got handed a few massive life-lessons in the process. I served my community in such a way that they could see my building ministry and vocation, and they allowed me to learn and grow. And now I sit in the liminal space before taking my oaths as a priest – before being vested with the stola of a priest (which is given to me by the folk). I will step into the role of a junior professed, whose path is renewed every year through continuing education. I wonder what this life will look like in a year, or two, or five. Or twenty. I’ve been “in formation” since 2012. In five-odd years, I’ve come an awful long way, but yet there’s still so much that I don’t know. I’m still so new at this. What will my life-long formation as a polytheist priest look like? Because I am not done. If anything, the wheels of change in my life are spinning at a rate that is almost dizzying. New doors are opening up for me, with new opportunities to study and practice my spirituality. This is a watershed moment that I am preparing for, yes, but it is only the beginning. To coin a phrase, this isn’t even my final form. I wonder what that will look like. Part of ADF’s core order of ritual is a moment we call Creating the Group Mind, which involves grounding and centering. Most groves work with what we call the Two Powers – fire and water – that represent the primal forces of creation. Water is down, dark, chaos, potential, swirling, magnetic. Fire is up, light, cosmos, order, creation, burning, electric. As they combine, we find the energy we use to do magic. Below is a quick and dirty two powers meditation that you’re free to use – it works well with both large groups and as a solitary practice. Enjoy! Children of Earth, breathe deep and close your eyes. As we stand here, preparing to work the magic that is found in our ritual, let us pause and release all the tension we may be carrying. Relax your arms and shoulders, ease your jaw and your forehead, and breathe deep into your belly. Now, let us take nine breaths together, to find our center and order ourselves in this great work. For the first breath, our roots reach deep into the earth. For the second breath, we draw up the swirling, chaotic waters. For the third breath, we are filled with the cool waters. For the fourth breath, our branches reach high to the heavens. For the fifth breath, we draw down the ordering, creative fires. For the sixth breath, we are filled with the burning fires. For the seventh breath, the waters and fires alight, turning into the druid’s mist. For the eighth breath, they expand and pour fourth, filling our grove. For the ninth breath, we open our eyes, one grove, to work our magic together. As a new pagan in the early 2000’s, I was aware that I ought to have a magical name, but I never gave myself one. Nothing ever fit. Then, one day, in a fit of pique over yet another Lady Onyx Raven Wolfmoon, I decided to call myself Toad Dandelion. I’ve used the name on and off over the years, always in jest, but it seems that if you jest about something long enough, it might stick. In the vein of several other excellent videos, I’ve made a brief ballot introduction about me, who I am, and how I approach this whole Non Officer Director thing that I’m running for. It’s about 3 minutes, and as always, if you have any questions you know where to find me! And remember, voting starts tomorrow, so be ready to make your voice heard!